Five hero dogs were honored on Wednesday with medals for their military and law enforcement service. 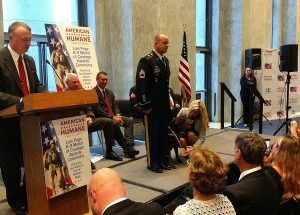 The American Humane Lois Pope K-9 Medal of Courage was presented to five K9s in Washington, D.C., during an awards ceremony that saw members of Congress, media, hill staff, a Marine general, and others come together to show respect for the life-saving work dogs do around the world. The dogs at the ceremony served in the United States Army, Marines, and even the Transportation Security Administration (TSA). They've saved lives by uncovering bombs in Iraq and Afghanistan as well as explosives, drugs, and other contraband at America's airports and even providing security for top American officials. K9s Alphie, Capa, Coffee, and Ranger were each presented with a medal, hung around their necks to great applause, during the ceremony. They all received celebratory pats on the head from audience members as they exited the stage wearing their medal. K9 Gabe was presented a metal posthumously and his handler Charles Shuck accepted it on his behalf. Explosive Detection Dog Alphie, a 7-year-old black lab, began his career in the Marine Corps where he worked to clear areas of improvised explosive devices (IEDs) in the heat of battle. Alphie and his handler Lance Cpl. William Herron kept the path clear of explosives during their two tours of duty in some of the most dangerous areas of Afghanistan. 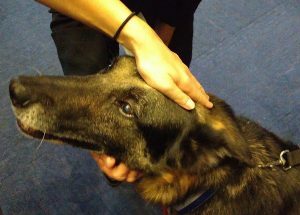 In 2014, Alphie was retired from military service but soon returned to work in the TSA's Canine Explosives Detection Program with handler Lesley Runnels. Runnels, who has worked and lived with Alphie for the last three years, said the awards ceremony was vital to reminding everyone how much military and other working dogs contribute. "It really brings awareness to the dogs that are working right now, as we speak, throughout the world—oversees and in America at airports, police departments, and Amtrak," she said. "I mean, these dogs are really keeping this country safe and our Marines and servicemembers safe. They really are." For Lance Cpl. Herron, though, the ceremony included another element: a reunion. He got to see Alphie again for the first time in four years. "It was awesome," he said smiling. "I missed him a lot, I gotta say. It's almost hard to describe, to be honest with you. I couldn't trust a human the way I trusted him, I'll say that." He echoed the importance of recognizing the work of the dogs and the sacrifices they make. "They have no idea what they're getting into," Herron said. "All they do is follow you and try to help you and protect you. It's like being blind and being tossed around. They never know. They never know where they're going to be day after day and they do it for years, their whole life almost. So, they really deserve that appreciation." 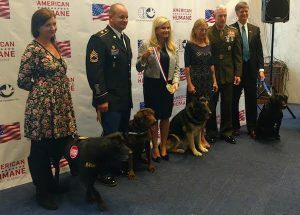 Before receiving the American Humane Association's Medal of Courage, Capa, a 10-year-old German shepherd, was awarded the Navy and Marine Corps Commendation Medal for meritorious service during his deployments in Iraq with handler U.S. Navy Master-at-Arms Petty Officer 2nd Class Megan Wooster. Capa worked at detecting explosives and providing security while on deployment and even participated in missions protecting the president of the United States, first lady, and secretary of defense. Though Wooster remains on deployment, Capa is enjoying a well-deserved retirement under the watchful eye of Megan's mother Kim Staymate. As Capa's self-described grandmother, Staymate said it was "very heartwarming" to participate in the ceremony. "These dogs are everything to their handlers," she said. "They are family and their life-link and their safety. It means a lot for them to be honored." Coffee, a 13-year-old chocolate lab, served three tours in Afghanistan as a bomb-sniffing Army dog, all with handler U.S. Army Sgt. 1st Class James Bennett. Over their nine-and-a-half years of service together they sniffed out IEDs and faced deadly ambushes from Taliban fighters who specifically targeted military working dogs as high-value targets. But Coffee and Bennett always brought back every soldier they were sent to protect. The work led to an incredible bond between the two. "When we deployed it was just me and her," Bennett said. "This is a unit. One dog and one handler is a unit. The bond really comes in the living. You're living with this partner of yours 24/7, 365 days. It's you and her." It was Bennett's wife Lindsay that first encouraged him to nominate Coffee for the Medal of Courage because she saved not only the other soldiers' lives but Bennett's. Ranger, an eight-year-old black lab, served with the Marines in both Afghanistan and Iraq uncovering IEDs and saving lives. While deployed, Ranger had a heat stroke and was retired from military service in 2012. Kirk Adams, a retired police sergeant, and his wife adopted him shortly thereafter. Ranger was diagnosed with cancer after Adams adopted him. He recently had surgery and went through chemotherapy. 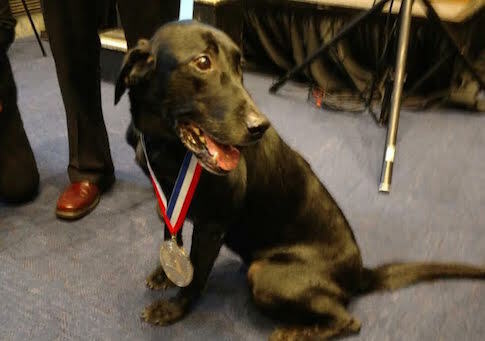 While Ranger is still battling the cancer, his energy level was high at the ceremony, and he was very excited to receive his medal. "I was moved emotionally because, you know, I obviously haven't been to a theater of war so I don't know what they have to endure but, certainly, I know that he has been through a lot," Adams said. "I'm just grateful that American Humane and Ms. Pope have chosen to honor these dogs. It means a great deal to me that he gets the recognition that he deserves." Gabe, a yellow lab, served in more than 200 combat missions in Iraq as a specialized search dog with the Army. Working with his handler, United States Army Sgt. 1st Class Chuck Shuck, he helped find 26 explosives and weapons caches throughout the country. In 2013, he passed away peacefully while being held in Shuck's arms. "Before I got Gabe, I don't want to say I didn't like dogs but I didn't do all the slobber and the dog hair. The military gave the opportunity for the dog school and I said ‘why not?'" Shuck said. "I went there and getting Gabe on that second day of school was, I mean, I instantly fell in love. In the four-and-a-half years I was with him there was only one day I didn't actually see him." Shuck said it was important to him to see not only Gabe honored but the other military working dogs as well. "Every bullet, even if it was just one bullet, that you found was potentially a bullet that a sniper could use on an American soldier," he said. "To be with the other four handlers and hearing their stories, it's just very humbling, I'm honored." This entry was posted in Issues and tagged Army, Dogs. Bookmark the permalink.